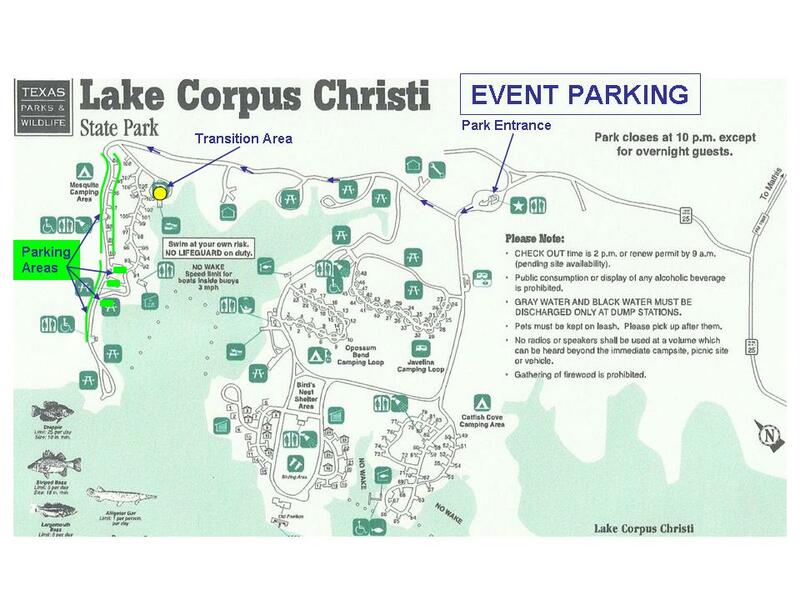 The Keep Texas Wild Triathlon at beautiful Lake Corpus Christi State Park offers two race distance options. The Sprint, Sprint Relay and Mini-Sprint Triathlon. The course can be challenging for new and experienced triathletes. The swim is in deep open water with wave starts (many athletes swimming side by side). The bike is an “open course” which means that although law enforcement will be present, the roads will be open to regular vehicular traffic. There are some small hills on the bike course. The run course is hilly. Please do not attempt this race unless you are well trained and prepared. All finishers will receive a custom finisher medal. No Refunds (Rain or Shine). No Race Transfers except for Relay Team. Online Registration Closes at 6pm on Thursday, May 2, 2019 and is limited to the first 150 registered participants. Packet Pickup will be held on Friday, May 3, 2019 at Bay Area Bicycles from Noon to 7:00pm. Please make note of the end time for Packet Pickup: (7pm). Bay Area Bicycles is located at 6020 SPID, Corpus Christi, TX 78412 in the Gulfway Shopping Center at Airline and SPID. Late Packet Pick Up is available at the race site for athletes traveling from outside the Corpus Christi area. You must be at transition between 6:30 am. and 7:00 am. Since you will not have a race bib for entry into the State Park, there will be a $5.00 per athlete fee at the park entry. Contact the Race Director if you need to utilize late packet pick up. Remember to bring your USAT membership card to packet pickup if you are a member. If you do not have your USAT card with you at packet pickup you will be required to purchase a one day USAT membership to obtain your packet. All participants must pick up their own packets and bring some form of governmental ID card to packet pickup. You MUST be covered by USAT supplemental insurance to participate in this Triathlon; NO Exceptions. You are covered by USAT insurance if you are a member of USAT. If you are not a member of USAT, you must purchase a one day membership to USAT. The one day membership for USAT is $15 for Adults ages 18 and up and $10 for Youth ages 17 and under. If you are not a USAT member, you can purchase your one day membership when you register for the event. You can also purchase your one day membership at regular packet pickup. The registration fee shown above for the event does not include the one day membership for USAT or the cost of a USAT membership. The $15 fee or the $10 fee is collected by event management on behalf of USAT. Groups or individuals, we need all the help we can get! Volunteers are an integral part of producing successful events. Volunteering for KTW is a great opportunity to support your community, earn required services hours, and build team work and camaraderie. *Some race day volunteer assignments include kayakers (swim course safety), food prep and distribution, aid station drink distribution, packet and timing chip distribution, course turn direction, finisher medal distribution, and more! Click here to email Chris and volunteer. The swim will be held in Lake Corpus Christi. 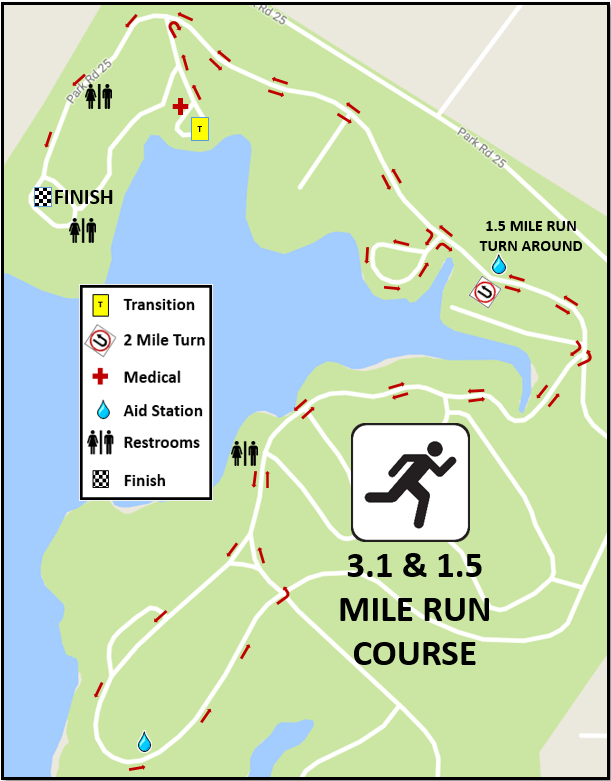 It will be wave starts on a clockwise rectangle course. Athletes will enter the water by wave assignment and start approximately 2 minutes apart. Sprint swimmers will turn at the last orange buoys. 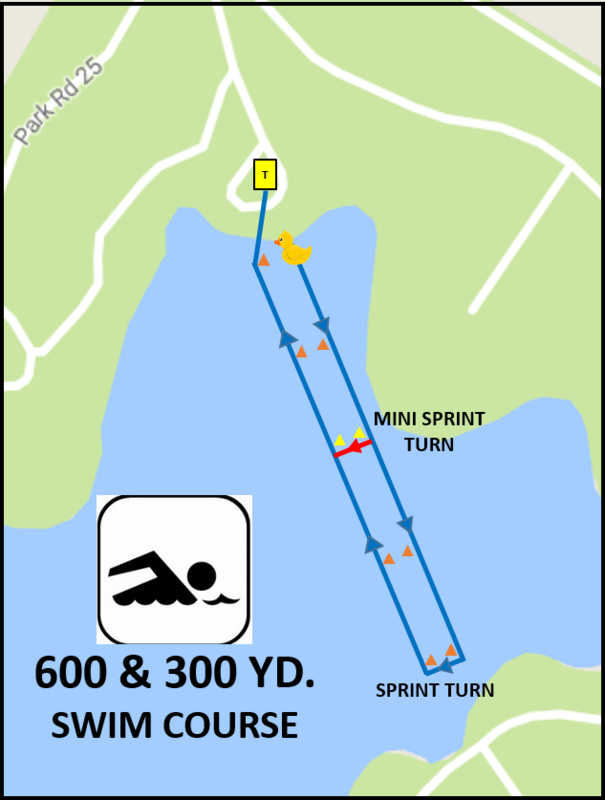 Mini-sprinters will turn at the green buoys. 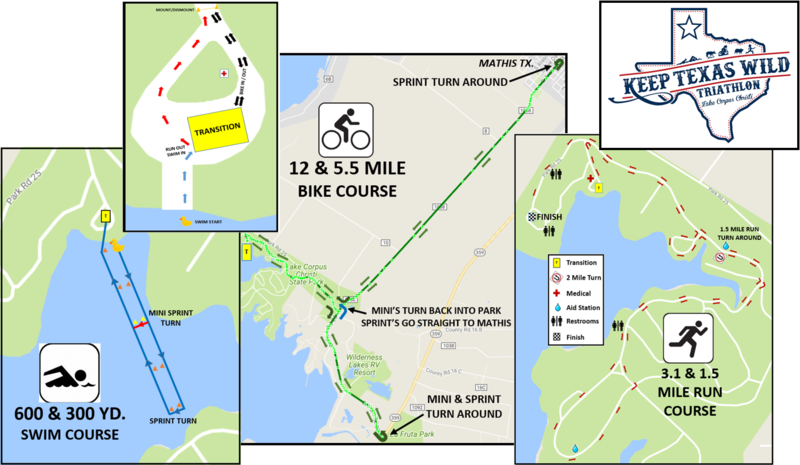 The bike course starts in the park and exits to the right on Park Road 25. The turn-around is on Park Road 25 just before Highway 359. Once back at the park entrance, Mini-Sprinters will turn left back into the park. Sprinters will proceed past the entrance towards Mathis on FM 1068. The turn-around is on FM 1068 in Mathis. Once back at the park entrance, Sprinters will turn right into the park. Bike support will be provided by Bay Area Bicycles. 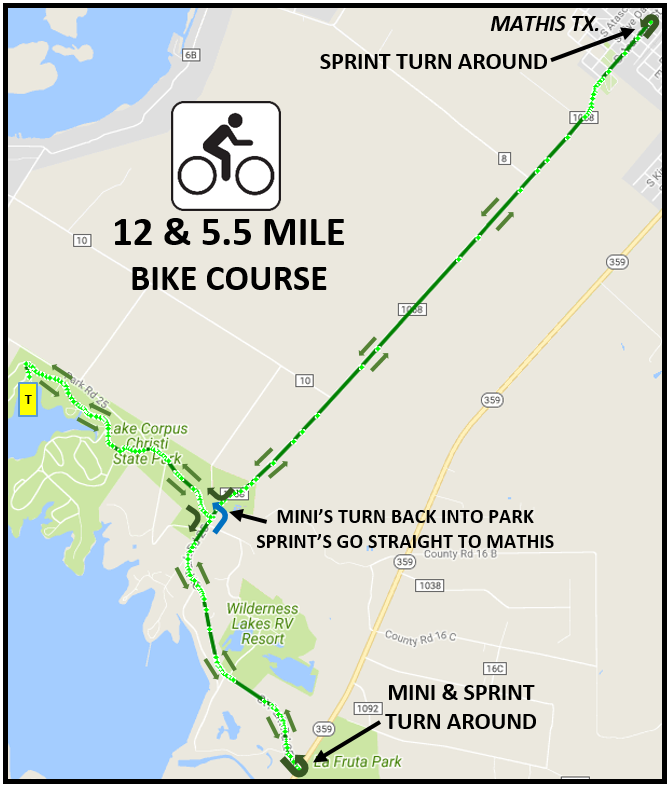 The bike course will be marked with white signs that have blue directional arrows. The run course will be on paved roads located inside the State Park. The run course will be marked with orange signs that have black directional arrows. The orange signs will be mounted on top of orange traffic cones. The run course is an out and back. Location: Lake Corpus Christi State Park. The park is on Park Road 25 located 4 miles southwest of Mathis, Texas off of State Highway 359. It is 35 miles northwest of Corpus Christi. Park Entry: The State Park entry fee is included in the registration fee for regular packet pick up participants. Show your race bib to the park entry attendant for “free” entry. Spectators and late packet pick-up participants will pay a $5 per person entry fee. Entry for kids 12 and under is free. Arrive early! It will take time to get through the line at the park entrance, find a parking spot, and walk your gear to transition. Have your race bib ready to show at the park entrance for free entry. Athletes Guild will provide timing for the Mini-Sprint and Sprint Triathlon. You will be issued a timing chip with a velcro strap the morning of the event. You must wear your timing chip on your left ankle during the entire event. For relay teams, you will exchange the timing chip in transition at the location where your bicycle is racked. For information about overnight RV or tent camping, air conditioned shelters, or other park amenities click here. We have a discounted rate of $79.00 at La Quinta Inn, 12909 I H 37, Mathis, TX 78368. 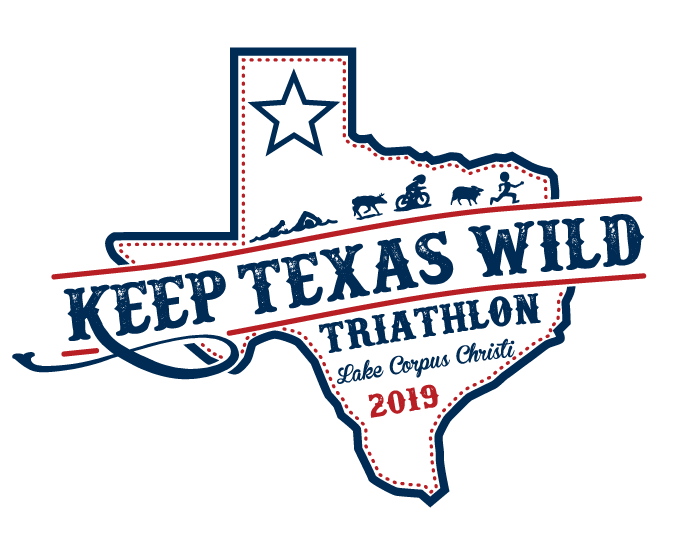 Call 361-547-0200 and let them know you want the “Keep Texas Wild Triathlon rate”. You must book by April 20, 2019 to receive the discounted rate. The rate is only good for Friday night, May 3rd. If this is your first Triathlon, ﻿click here﻿ to read some helpful tips on preparing for race day, what to expect at the race site, and commonly violated USAT rules. Preparation = Confidence! A portion of race proceeds will benefit Colin's Hope to prevent children from drowning.